Welcome to the our bookstore. This store is a run in association with Amazon.com. Sales from this store will assist Consider Christianity in carrying out its vision. Please check back frequently as new titles are added. Books you can buy NOW! Volume 1 , by Elgin L. Hushbeck, Jr. The chapters dealing with science and religion “are some of the finest I have ever seen on this topic. Closely argued, deeply ined, highly sensitive to the issues. Publish the world needs you.” –– Dallas Willard, Professor and past Dirctor of the School of Philosophy, University of Southern California. by Elgin L. Hushbeck, Jr. This second volume of Consider Christianity continues where the first volume left off. If the Bible is reliable, what does that mean for our faith choices? What is the evidence for the major beliefs of Christianity, are they relevant, and what does that mean to you? Dr Black lays out the case for believing that Mathew was the first Gospel to be written, and probably before 44 A.D. Luke was written second while Paul was in held in prison in Caesarea between 58 -60 AD. Mark was third and based on a series of speeches given by Peter using both the Gospels of Matthew and Luke, and finally John written at the end of the century. The book is written for laymen and not only lays out the case for the priority of Matthew, but also give a clear insight on the development of the early church, the challenges it faced and how the Gospels were a response to those challenges. For those wishing to go deeper, Dr Black has included an extensive bibliography. Highly Recommended. 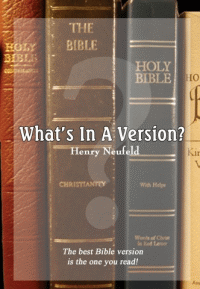 Henry Heufeld writes about Bible Translations from his knowledge as a student of Biblical languages and his experience teaching them to laypeople and discussion them on the Internet. What's in a Version? provides a basis for the lay student to understand how translations are made so they can understand the arguments and become confident of the Bible Version they choose for reading and study. Award-winning reporter and author Lee Strobel once again uses his investigative skills to address the primary objections to Christianity. As a er atheist, Strobel understands the rational resistance to faith. The Case for Christ records Lee Strobel's attempt to "determine if there's credible evidence that Jesus of Nazareth really is the Son of God." The book consists primarily of interviews between Strobel (a er legal editor at the Chicago Tribune) and biblical scholars such as Bruce Metzger. Each interview is based on a simple question, concerning historical evidence (for example, "Can the Biographies of Jesus Be Trusted? "), scientific evidence, ("Does Archaeology Confirm or Contradict Jesus' Biographies? "), and "psychiatric evidence" ("Was Jesus Crazy When He Claimed to Be the Son of God?"). Together, these interviews compose a case brief defending Jesus' divinity, and urging readers to reach a verdict of their own. Bible. Of particular interest is John W. Wenham essay on; Christ's View of Scripture. intelligent faith grounded on objective, verifiable evidence. Presenting your faith to the confirmed unbeliever. Scripture against its critics and detractors. This book makes available to a wide audience answers to a wide variety of the classic objections raised against Christianity. It is particularly useful for those doing evangelism with high school and college students, as well as thinking laypersons. To order a single book simply click on the Title or "Click to buy it." This will take you to Amazon.com were you can place the order. To order more than one book click on the Title, the Image of the book, or "Click to buy it" of the first book you wish to buy. This will take you Amazon.com. Order this book using the "Add to Shopping Cart" button. Then use the "Back" button on your web browser to return to the Consider Christianity Bookstore where you can select your next book. Repeat this until you have selected all of your books, then you can "Proceed to checkout" to order these books. Copyright © 2018 Consider.org, All rights reserved.